Dal was a big part of my childhood. Pretty much every time my grandma cooked for us, there was dal. And she cooked for us a lot. My grandma’s Gujarati dal was different than my mom’s. While mom’s was spicy and comforting, grandma’s dal had a whole different flavor profile. 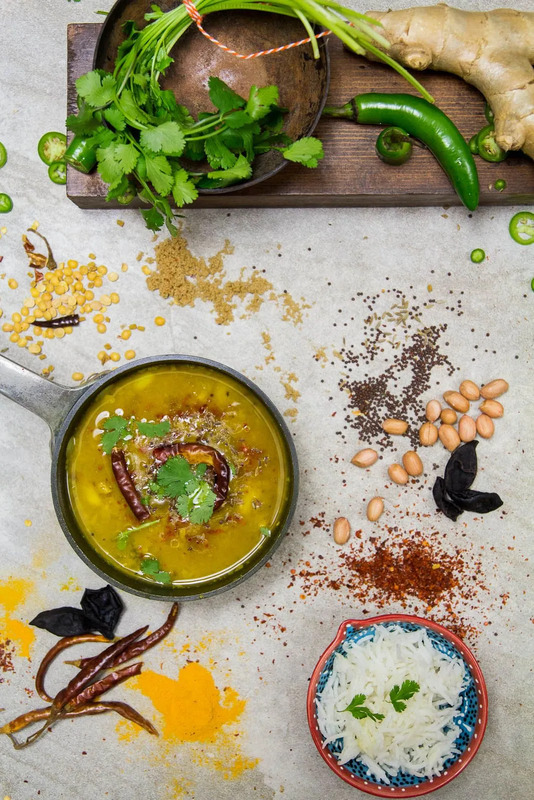 Grandma’s dal was traditional Gujarati food – sweet and spicy and tangy all at the same time. Grandma has a reputation for being a stern woman. Most people who know her are terrified of her, or were when she was younger. But she has always been incredibly loving with me and my brother. She cooked for us and secretly slipped us cash on a regular basis. She would even play cards with us for hours on end when we were kids. She taught us how to play cards like adults. There was no letting us win. She expected us to learn the rules and hold our own. In the same way, Grandma was very strict and traditional when it came to cooking Gujarati food. In traditional Gujarati food, the balance between sweet and spicy and tart is most important. 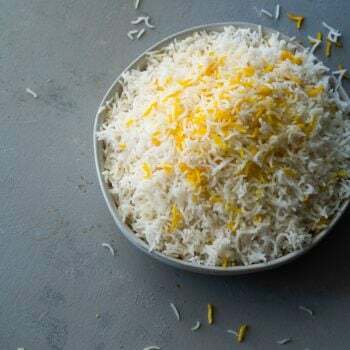 While my mom and I tend to experiment, often leaving the sugar out of traditional savory dishes, Grandma insisted on the sweet Gujarati style. To her, the sugar is a crucial part of the flavor profile. Even though she has mellowed slightly now that she is pushing 94, Grandma has very specific tastes and she will tell you if your cooking is not up to par. She doesn’t do much cooking anymore but when she did, she was very particular. Her kitchen was always sparkling clean. There was no experimenting in her kitchen. She liked things a certain way and that’s exactly how she did them each and every time. When I think back on Grandma’s cooking, there are two things that stand out: her dal and her stuffed eggplants. I’ll be sure to share her stuffed eggplants another time. In true Indian style, she never measured anything, everything was done by sight and taste. I’ve attempted to write down the recipe here but it will need some adjusting depending on how spicy your chilies are and the sourness of the ingredients you use. 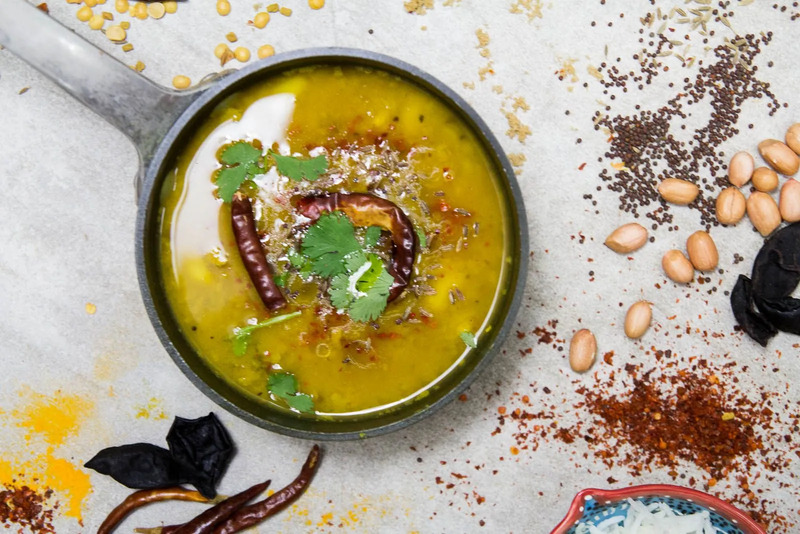 Gujarati Dal – the flavors of this are a delicate balance of spicy, sweet and sour. Rinse the pigeon peas in cold water until the water runs clear (about three times). If using a pressure cooker: cook the pigeon peas and the kokum with 2 1/2 cups water for 20 minutes. 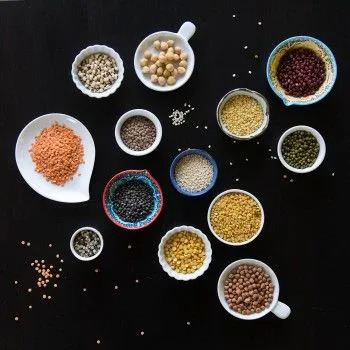 If you don’t have a pressure cooker: In a large pot (I use my Dutch oven), boil the pigeon peas and kokum in 6 cups water for about 90 minutes, until the peas are soft. (This may take longer if your peas are old. Just cook until the peas have softened.) Keep an eye on the water level. You will probably need to keep adding water. If the water runs low, just add enough so that the water covers the dal but not too much. Once the dal is cooked, add 3 cups of water, brown sugar, green chili, ginger, peanuts and salt. Bring to a boil. While the dal is boiling, work on the “vaghaar” (tempering). In a small saucepan, heat the 2 tbsp of ghee or oil. When the oil starts to shimmer, add the cumin seeds, mustard seeds, and fenugreek seeds. Let cook for about 10 seconds. There should be a lot of sizzling and popping. Add the turmeric and chili powder to the hot oil, stir and immediately pour into the lentils. Let the lentils continue to boil for at least 15 minutes. You can boil for up to 45 minutes. Just make sure to add water if you boil longer. The water should just cover the lentils. Turn off heat. Stir in the cilantro. 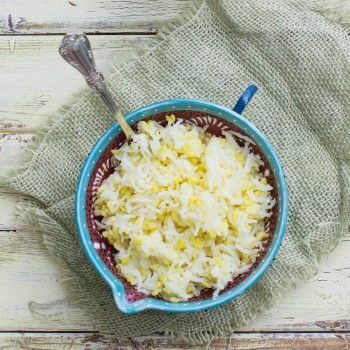 Serve warm with rice. 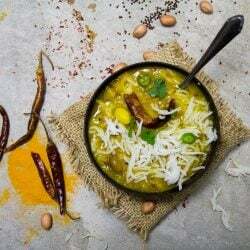 It is said that the longer the dal is boiled, the better it is. So if you want your flavors to be really well integrated, boil the dal for longer. Kokum is available at Indian stores and online. 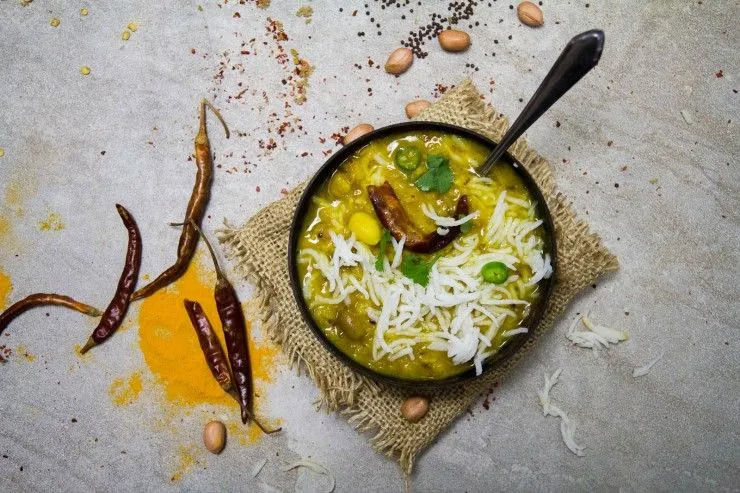 But if you don’t have it on hand and want to make this dal, it is no problem. You can substitute lemon juice, tamarind or even tomatoes. If using lemon juice, add 2 tbsp of lemon juice at the end after you’ve turned off the heat. If using tamarind, soak a 1 inch sized ball in 1/4 cup of warm water for about 20 minutes. 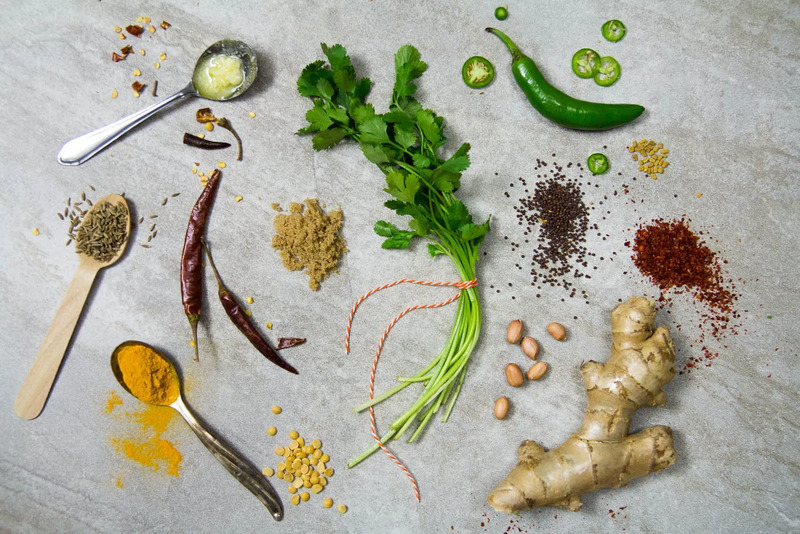 Add this water to the dal after the dal with the ginger and green chilies. You can also use tomatoes, but try to use some that are tart (as opposed to sweet ones like Roma). Add about 1/2 cup of chopped tomatoes to the dal when you add the ginger and green chilies. Comments on "My Grandma’s Gujarati Dal"
This dal recipe looks fabolous and your pictures of the ingredients and the cooking process look super professional. Good work. Looks great! I'll be making this tonight along with some home made parathas. Wonderful pics! Look like paitings, and the recipe sounds great as always, too. I cooked it tonight - fabulous! Thanks for another great recipe! When you say peanuts in this recipe, do you mean whole or ground? Sorry if that seems like a stupid question. In today s modern world where everyone leads a fast lifestyle, it is so lovely to hear you describe your grandma fondly. Been a favorite with us since I first saw it on your web site last February. Thanks for sharing...the recipe as well as your grandma. Hi Carla! Michelle is right. Gujarati food is often made without garlic and onions. Gujarati food and culture is heavily influenced by Jainism. The followers of which do not eat root vegetables as it kills the entire plant. Many Hindu Gujaratis, specifically the followers of Krishna, also do not eat onions and garlic. My great grandmother did not eat onions and garlic and therefore my grandma's dal does not list them as ingredients.